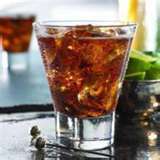 Real Black Tooth Grin drink recipe made with Cola,Jack Daniels,. How to make a Real Black Tooth Grin with all the instructions and ingredients. This is Pantera's favorite drink. Think of a very stiff Jack and Coke, with reversed proportions. take Jack Daniels and add just enough Coke to make it black. Be forewarned, the next day your whole body might be black and you will NOT be grinning. For serious drinkers only. Sidecar Real View This Recipe! Dime used Crown Royal and Coke not Jack. Either crown royal or Seagrams 7, or a combo of both. Fix this, please. Dime used a shot of Seagrams 7, a shot of Crown Royal, and just enough coke to turn it black. This IS the origianl recipe. correct, seagrams 7, crown and cola. Came from the song sweating bullets by megadeth.Dimebags favorite drink.